An interesting complement to our previous post on ethnic marketing and the challenges it poses to marketers who want to go beyond cultural clichés. Here is the link to a study published by Mediaege:cia: Reaching the ethnic consumer: A challenge for marketers . Thanks to www.redhotcurry.com for the link! Is there such thing as ethnic (tribal) marketing? "How do you reach an emerging generation of young American consumers too jaded when it comes to traditional marketing approaches and too savvy for conventional research techniques? " This is the question asked by marketing consultants and bloggers David Morse, Thomas Tseng, Susanna E. Whitmore and Julio Arreaga. If you want to get more knowledgeable on the topic a good reference in French is Alternatives Marketing by Bernard Cova, Professor at ESCP-EAP (Paris) and Véronique Cova, Professor at Université de Toulon-Var. In a previous post we observed that, sadly enough, blogs had not really made their way through business schools. Indeed, only a handful of courses are really shaped around blogs. Well, there is a great news: This is changing! Euromed-Marseille is launching the first (as far as we know) course in a European business school truly articulated around a blog. We are proud to join forces with Professor Walter Baets to build this Complexity, Innovation and Knowledge blog. We are working hard on adding a new dimension, that of leveraging his blog with Cyberlibris resources. In a few days, Walter has become a genuine blogger. Not only that! He has come up with lots of ideas on how to transform his class in a genuine learning and knowledge sharing community. In a sense, Walter has empowered his students with new ways of expressing themselves. The class is about to start and we wish Walter all the best. Walter's example is one example of what blogs can do in and to a business school pedagogy and research environment. Schools have long contemplated e-learning platforms. Some have invested in them. Now, blogs are around and they may indeed be a simple and flexible solution. You'll find on Joi Ito's wiki an interesting discussion on the respectives advantages of blogs and e-learning platforms. In a next post, we'll go into more details on how best to implement class blogs and how to take advantage of content management through RSS feeds (which we are currently using a lot at Cyberlibris). To put it simply, the pianist does not have to bring the stool to the piano anymore. The piano is coming to the stool (not any kind of piano though!)! "Thanks for speaking about our book! At the risk of taking the suspense out of your reading, I can help you with some of this puzzle. The 2 stances are not irreconciliable. In Confucius' time only the divine emperor had intellectual property (IP) rights -- indeed, the concept of individuals and companies having IP rights remains alien to Chinese culture today, as you point out. The first mention of protection of IP was made in Chinese legal codes in the early 20th century. Also, to Confucius, moral duty did not extend beyond 5 relationships -- which do not include foreign companies. As with everything in China, the answers are not simple, but hopefully comprehensible. If not, please let me know." I have always been convinced that the devil lies in the details. This is a Chinese vivid proof of it! Thanks again Usha for taking the time and welcome to the Blogosphere! Yes Ecto is great to create your post off-line, especially for Mac users. 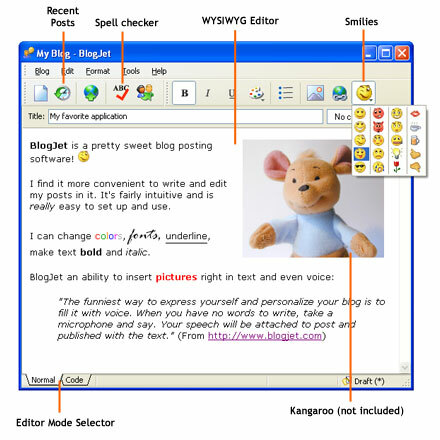 But for Windows users there is a challenger Blogjet . Here is a screen shot of what it looks like. Easy to use indeed! This post was made with it. Thanks to Buzz at Buzzmodo for the hint! PS: The one thing I have not found yet is the trackback function.